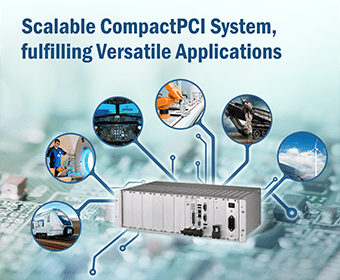 Advantech continues its commitment to develop, deliver and support the CompactPCI® product line. With over 10-years of experience in CompactPCI blades and system design, we have delivered thousands of products to OEMs across the world. Advantech CompactPCI platforms are widely used in mission-critical industrial and telecommunication applications that demand enhanced reliability, high-availability and serviceability as well as long-term upgradability and manageability. Advantech CompactPCI blades are designed with the latest Intel® silicon available and offer a comprehensive upgrade path for legacy products as well as a solid base for new designs. Each new blade iteration is designed to facilitate product continuity in industrial and telecom applications by providing simple and economical upgrades which renew and extend the lifecycle of deployed OEM equipment. We continue to diligently select components with guaranteed longevity of supply in order to prolong product lifecycles as long as possible for customers. We follow industry standard quality and revision control processes and offer worldwide RMA services for faster serviceability. For increased throughput and multi-core scalability, every one of our new SBC designs supports a comprehensive range of Intel® processors, chipsets and controllers, designed for optimum performance and scalability whilst reducing overall power consumption and carbon footprint. Advantech’s value-add comes from a broad range of flexible design options on standard product with the ability to customize when it makes the best technological and economical sense for the OEM. With an emphasis on local expertise and experience, Advantech's support teams and alliance partners offer on-site consultancy to address driver and software compatibility in new designs. In addition, when product modification or customization secures better overall system interoperability or facilitates re-certification needs, Advantech's design teams are available to share their design experience and knowledge of NEBS and similar standards to provide the optimum system solution. Advantech’s Industrial Automation division, designs and manufactures a wide range of 3U CompactPCI products for industrial communications and data acquisition. Full details can be found here.. This section contains Advantech’s Intel®-based CompactPCI single board computers, rear transition modules and peripheral boards, including XMCs and PMCs. Please note that Advantech’s Industrial Automation division, designs and manufactures a wide range of 3U CompactPCI products for industrial communications and data acquisition. Full details can be found here. Advantech’s Intel®-based CompactPCI single board computers are available in many configurations. The boards range from high-performance CPU boards for mission-critical telecom applications to more all-round processor boards for multi-purpose applications. Our high-performance 6U CompactPCI boards feature the latest Intel® processor technology with exceptional I/O expandability for graphics, networking and storage. These boards are designed to meet state-of-the-art needs in high density computer telephony and telecom applications as well as wide range of industrial, rugged and military requirements. Advantech works closely with a number of CompactPCI® enclosure manufacturers who supply a wide range of chassis from 1U to 12U. Contact your local sales office for details. Peripheral boards and modules for CompactPCI® products.